1. Reports Center Standard & Professional fails to create Stored Procedure (dbo.DetermineDateRange). Some installations of Reports Center Standard & Professional fail to create the Stored Procedures necessary for report generation. 2. 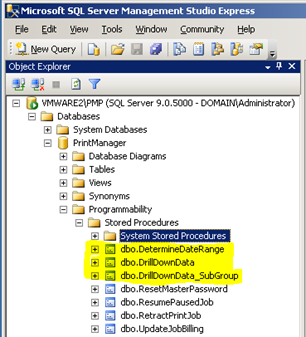 Opening the script (CreateProcedures_SSI_em.sql) with Server Management Studio Express. b. 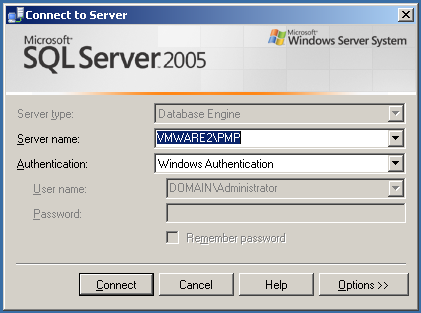 Next, you will be prompted to enter the path of your SQL database, depending on the installation of SQL either be it a local or remote SQL server, it should look something like this servernamePMP or (Local)PMP. Select Connect and then on to choosing the database to apply the script too. c. The following script will be applied to the PrintManager database, choose the drop-down arrow from the menu and choosePrintManager and then select Execute. (This will create the Stored Procedures required for Reports Center to work properly) There won’t be any noticeable dialog box but if you wish to make sure that the changes occurred, you can close Studio Express and reopen it. d. Upon opening Studio Express (anew) you will be prompted to connect to the database again. e. To view the changes expand Databases>PrintManager>Programmability>Stored Procedures (you should have a very similar screen to the below example). 3. You can now close Studio Express and open Reports Center Standard or Professional and run reports.